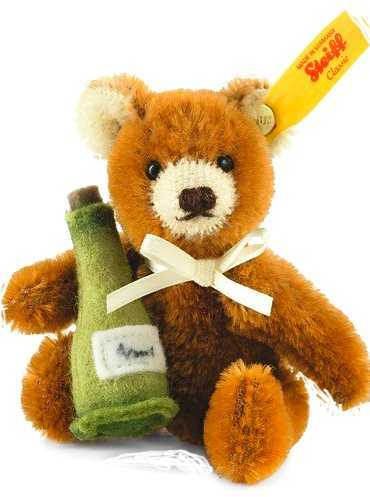 Margarete Steiff GmbH teddy bear, handcrafted in Germany with the world-famous "Button In Ear" trademark: a mark of absolute top quality..Teddy With Champagne Bottle has a with brass plated "Button in Ear". This fully jointed miniature Steiff teddy bear is ready to celebrate with his tiny felt Champagne bottle. Handmade from the finest, short pile brown mohair in brown, with a pale muzzle and inner ears, with a hand-stitched nose and a white satin ribbon bow. 2015 Worldwide yellow tag edition. Steiff EAN 028908.